The Chimney is located at the southern side on Koh Haa 1 / Koh Haa Neung / Koh Haa Neau. This is ‘Island 1’ or ‘North Island’ to most people. It is just a very short trip (500m) across from The Lagoon, which is where so many divers and snorkellers hang out on the beach during their surface interval. The Koh Haa Islands archipelago is just 30 minutes from most Koh Lanta dive centers’ boat moorings, too. Divers at The Chimney Photo by Emmy AhlénTherefore, getting here from Koh Lanta is not a long or arduous journey. There are several diving parts to this island, and not all of them include going into The Chimney. There is a lot of healthy and diverse life around here, some of it using the corals and anemones for shelter and others looking for food. Reef fish, invertebrates, reptiles and the occasional shark are all seen here from time to time. What makes The Chimney so special? Well, apart from the deep and clear surrounding waters bringing lots of marine life to this group of five uninhabited islets, and the selection of other great dive sites within a few hundred metres, The Chimney is unique in its makeup and topography. Carved out of limestone over thousands of years, this tiny island has a system of caves and caverns which can easily be entered and enjoyed by most certified scuba divers. There are several entrance points and lots of tunnels and swimthroughs. One or two are narrow enough to only be suitable for more experienced divers, and all require good to very good buoyancy control. However, reputable Koh Lanta dive centers only employ professional SSI & PADI Divemasters, and will make sure that anyone and everyone who dives to The Chimney will be able to do so. One of the most popular ways to dive this great site is to enter the system quite early in the dive then exit after 20 minutes or so and continue diving around the reef and rocks outside. There’s plenty of life around the rocks, boulders, barrel sponges and sea fans. Anemones are home to plenty of Anemonefish (Amphiprioninae) and there are lots more reef fish swimming around here along with predatory pelagic fish, including Barracuda (Sphyraena). Some divers report sightings of several species of medium-sized sharks here, the most popular being Leopard / Zebra Sharks (Stegostoma fasciatum) which are docile and nocturnal bottom feeders. More exciting, but far less shy and difficult to spot are Whitetip Reef Sharks (Triaenodon obesus) and Blacktip Reef Sharks (Carcharhinus melanopterus). 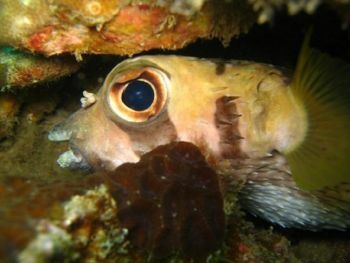 Porcupinefish (Diodontidae) Photo by Emmy AhlénThere are some marine reptiles which can be seen around this island, but not normally in the cave / swimthrough system. They are Green Turtles (Chelonia mydas), Hawksbill Turtles (Eretmochelys imbricata), and Banded Sea Kraits/Snakes (Laticauda colubrina). There are also many species of interesting invertebrates in The Chimney and around the island. Octopuses tend to be quite common in this part of Thailand, especially compared to Koh Phi Phi and Phuket. They are masters of disguise, and on most occasions divers swim past them without even knowing of their presence. Squid and cuttlefish, octopuses’ cousins, are far easier to spot, as they spend a lot of time swimming around in open water and don’t hide in holes or change their skin colour or texture for camouflage as much. Several species of small bony fish, including seahorses and pipefish (Syngnathinae), such as the Ornate / Harlequin Ghost Pipefish (Solenostomus paradoxus) are searched for by Divemasters and photographers. Frogfish (Antennariidae) are also difficult to spot but very popular. 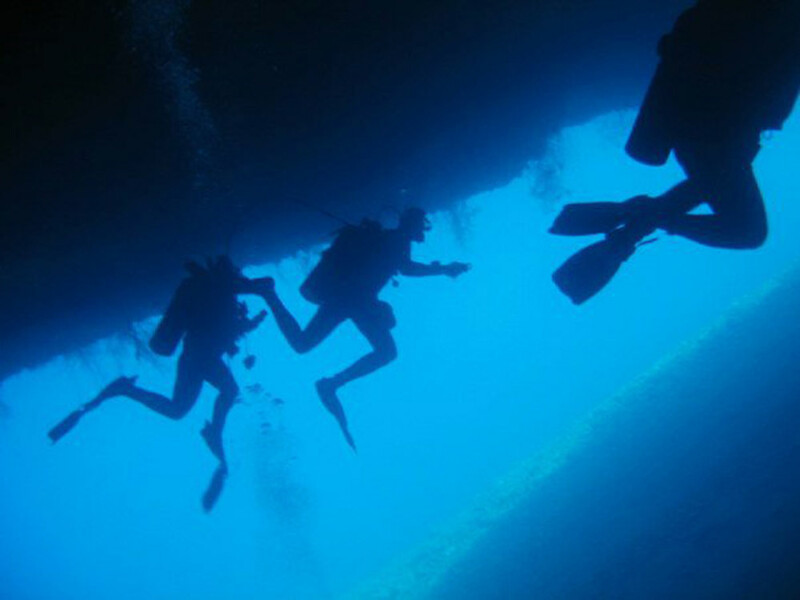 Sea conditions are usually favourable for recreational scuba diving at Koh Haa’s northernmost island. There are times when the wind or currents can make things more challenging, but Divemasters will plan dives in favour of any current and surface waves are only an issue when trying to return to the boat at the end of a dive. At present, the local authorities close Koh Haa National Marine Park between May and October, but there are rumours that the opening days will be extended, or that it could even stay open year round.